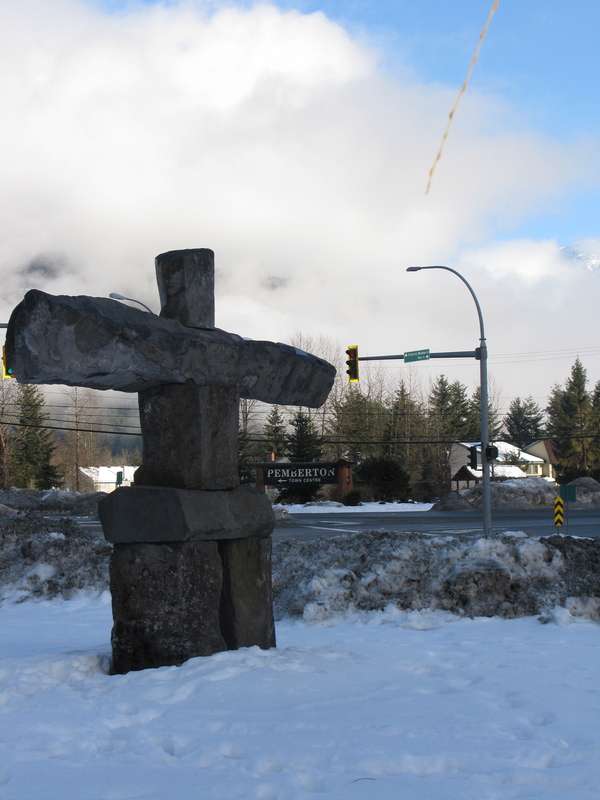 The inukshuk, an Inuit wayfinder, points the way to Pemberton. The Village of Pemberton, Chamber of Commerce and Spirit Committee are all working hard, on shoestring budgets, to try and optimise Olympic opportunities…Local businesses are contemplating extended hours, and house parties at the Community Centre and Youth Centre are planned around the Gold Medal hockey games. #1. No checkpoints, no delays, no worries. #99. It’s home to the craziest Polar Bear Swim in the corridor. #399. THREE gas-stations! No line-ups. #579. The Library is open to the public, 7 days a week. #641. As Pemberton’s Mayor Jordan Sturdy says, “We’re the Sky in the Sea-to-Sky.” That’s hella head-clearin’ fresh air. #663. Our firefighters double as supermodels and their calendar proceeds will go to support Haiti earthquake relief. # 702. Pemby boasts the best baristas in the corridor. We take our coffee seriously. #888. From Feb 12-28, the Community Centre and Youth Centre will host Live Sites for the gold medal hockey games, a dinner theatre and two house parties. #1109. The Seed Potato Capital of Canada is THE place to order hash-browns, potato salad, home fries, or a breakfast burrito. All Pemberton’s restaurants use locally-grown spuds. #2008. Take care of all of your errands, hassle-free. Just 25 minutes north, and you can conduct all your shopping day to day shopping routines. With two grocery stores, nine restaurant/café/bakeries, three physio/massage clinics, a dentist, a vet, 2 liquor stores, a pharmacy, Home Hardware, an outdoors outfitter, 2 clothing stores, 4 salons, and the best backcountry skiing, riding and sledding in the corridor, Pemberton’s the Back-Forty escape you need! #2010. Sometimes a change is as good as a holiday. Sure, you’re jealous of your friends who are in Hawaii right now. Who’s not jealous of someone in Hawaii at any time of the year… But take the free change of scenery anyway! For details about getting around, download the Village of Pemberton’s Residents Guide. Next Post Sustainable tourism is frog pose.